Next to juniper, coriander is the most common botanical in gin. 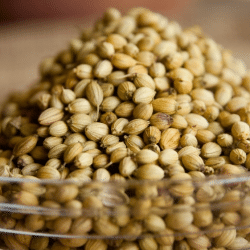 Coriander seeds, better known as the seeds of the cilantro plant can represent a significant proportion of the botanicals other than the juniper in most gin. Different regions often have differing profiles in gin. While northern grown Coriander can be oily and almost fruity, many distillers prize specifically coriander grown in Morocco or the South of Spain. The heat and long warm seasons result in the classic spicy, but slightly citrusy note that makes coriander such a welcome counterpoint.